In response to the whiteface photo of Paul Jerome the other day comes this photo from Bill Strong of a tramp clown. 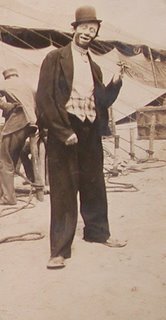 It looks as though this could be a younger Paul Jerome developing his tramp character on the Sells-Floto show in 1929 if it weren't for the fact that he was a whiteface on the Ringling show at that time. Anyone out there have any idea who this might be? In response to some questions from those out there as to whether or not there are any contemporary clowns who DO exhibit that ethereal quality of "Clown as Magical Figure of Childhood Wish Fulfillment" here is a man who understands the idea better than anyone else I've ever met... Mr. Steve Smith. Steve is currently working his unique magic as Director of the Big Apple Circus. And no, I don't think that he REALLY uses Crisco as a salad dressing. Not a "Variety Arts Professional". No deconstruction of the artform, not ironic in any way, no "Gen-X", "Gen-Y" "New Millennium", 21st Century, in-your-face, "extreme" or post-Modern aesthetic needed. 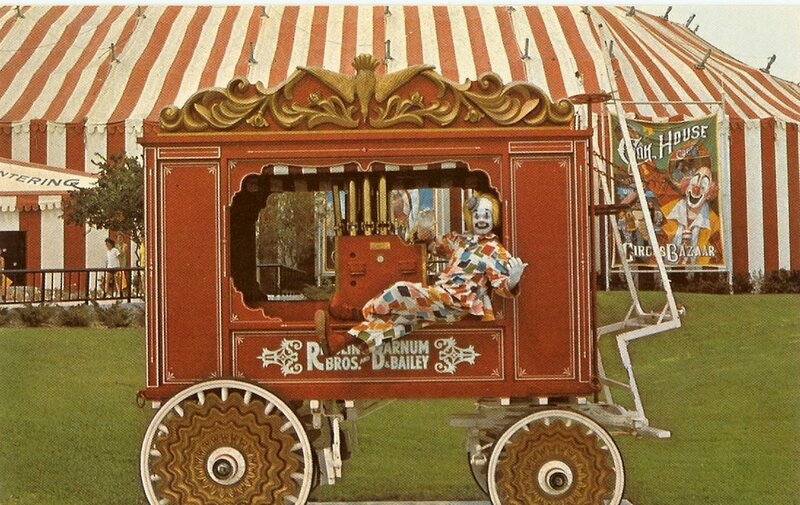 A "Circus Clown", pure and simple. 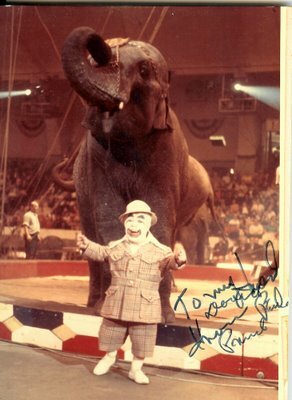 One of my very favorite photographs EVER: Lou Jacobs and Knucklehead. 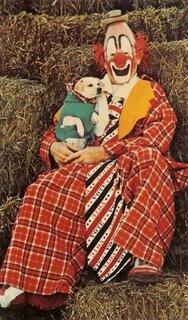 This photo was on my wall for many years growing up. My current costume's red, white and blue clown tie was inspired by this photo. It's hard to believe that Lou, not usually one to rock the boat, was allowed by Irvin Feld, a man of extremely conservative tastes, to wear a tie with such a simple and elegant yet potentially volatile political message in 1975/'76, given the post-Vietnam, post-Watergate era in which this photo was taken. Not only to wear it, but to have it be part of such a widely distributed publicity photo which was reprinted, full page, in the program and used on postcards. Lou Jacobs with a young Randy Concello in another of my favorites. 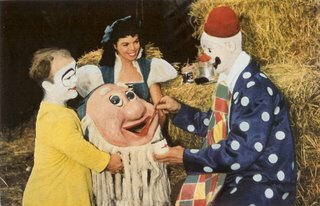 One of the best illustrations of "The Clown as Magical Figure of Childhood Wish Fulfillment". 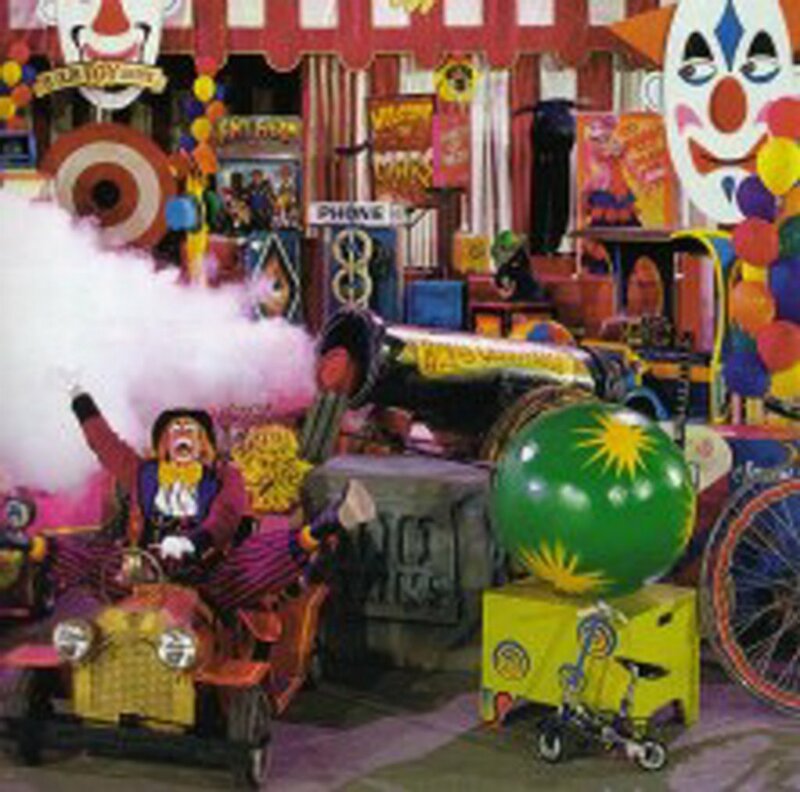 What child wouldn't want to spend a day up to their ears in cotton candy as a clown, complete with a clown father figure/playmate, in a whimsical Wonka-like wonderland filled with unimaginable fun and complete with magical, oversized toys and candy. 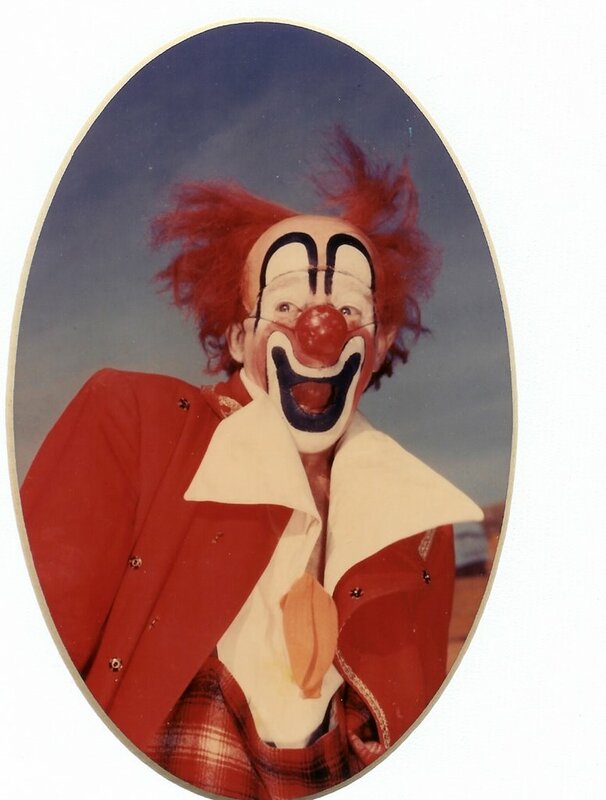 This aspect of circus clowning, one that Lou excelled at, is sadly too often overlooked in our contemporary, cynical world. Small kids haven't changed all that much, they still love toys and candy and they still expect clowns to be somewhat magical. Classic neat whitefaces Fred Hanlon and Charlie Bell in a color retouched black and white photo from National Geographic. An autographed photo of the longtime star of the Blackpool Tower Circus (the show featured in the film FUNNY BONES) , Charlie Cairoli. "BUMPSY ANTHONY, CLOWNING SINCE 1916, the original "SAD-SACK". 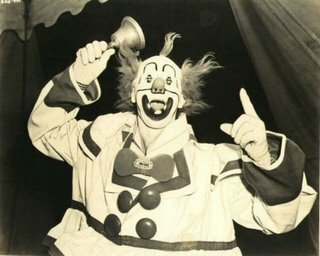 One of the clowns who has appeared at the CIRCUS HALL OF FAME in Sarasota, Florida." 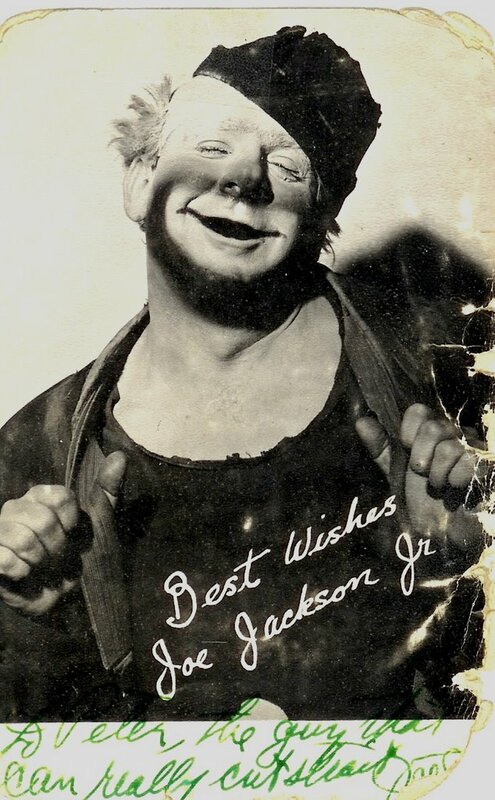 An autographed photo of Joe Jackson who inherited a brilliant breakaway bicycle act and tramp clown character from his father, over time adding his own spin to both. Between father and son the act was performed in vaudeville, circus and arena shows internationally for over 100 years. The Jacksons' tramp makeup may have been an influence of Otto Griebling. 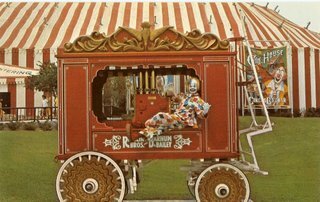 Keith Crary, a real clown, seated inside a reproduction of a calliope wagon outside a reproduction of a circus tent at the Circus World Showcase in Haines City, FL in the 70s. 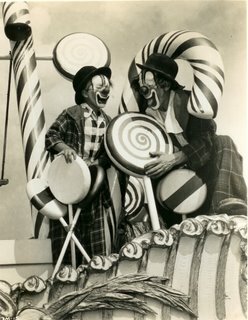 Another great shot from the classic Clyde Beatty-Cole Bros. Clown Alley, Bernie Kallman with his oversized blinking binoculars. 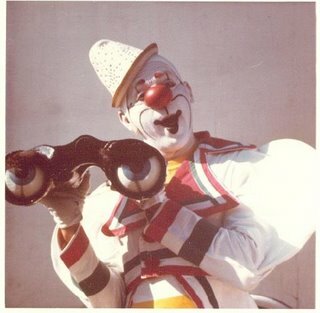 Many contemporary clowns have a foam version of these in their cache of parade props but I think that it's the fact that these look just like a pair of black metal or plastic binoculars and that they blink that really sells this one. Just having the big eyes on the end is only half the gag IMHO. 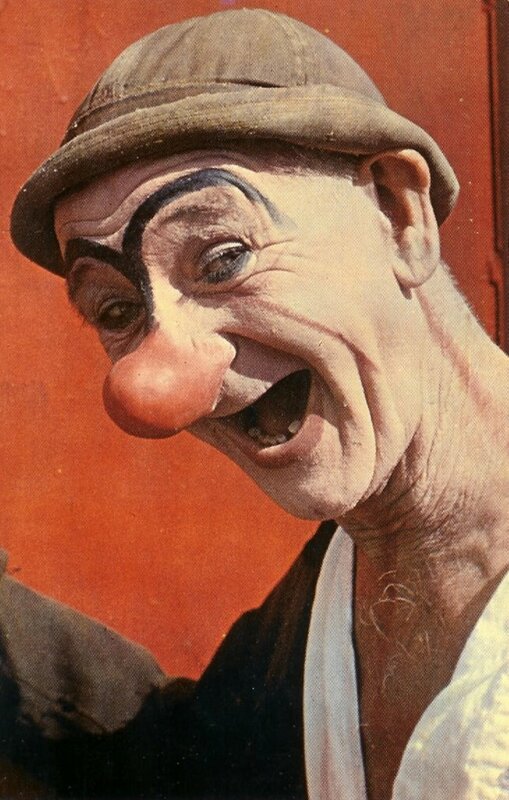 Before becoming a tramp clown, Paul Jerome created a equally great whiteface makeup which is often mis-identified today as being that of Felix Adler. Paul Jerome's whiteface wears a Adler-ish (Adlerian? Adlerific?) outsized white costume but without Adler's trademark padded rear end. 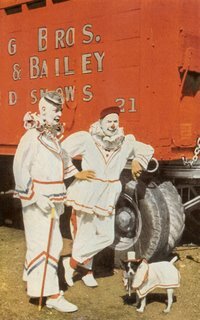 Jerome also favored clown shoes that looked like enormous bare feet when in whiteface. Jerome's makeup does feature a similar gap-toothed grin (three teeth to Felix's two) but differs in it's high arched eyebrows and comic strip style eyes, which give the appearance of Jiggs from the Geo. McManus comic strip "Bringing Up Father". Jerome's whiteface also differs from Adler's in that Adler's usually featured a gemstone in the tip of his nose. After he switched to tramp Jerome occasionally switched back to whiteface for publicity photos but found much greater fame with his tramp makeup and his assortment of battery-operated props such as his light up nose, glasses and heart. 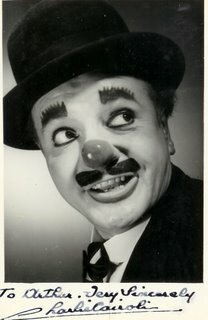 Paul Jerome's makeup seems to have been a strong influence on the makeup of "Cliffy", the clown who appeared on the 1950s television program Super Circus. 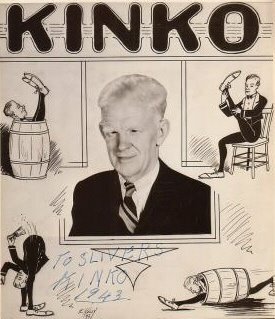 Glen "Kinko" Sunberry without makeup. 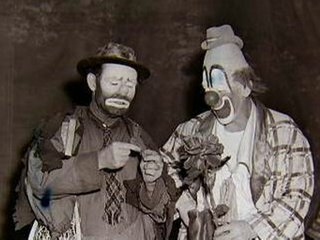 Though they must have been good friends (Emmett had come to Clown College to see Lou on at least two occassions in the 70s) there are very few pictures of Emmett Kelly and Lou Jacobs together. 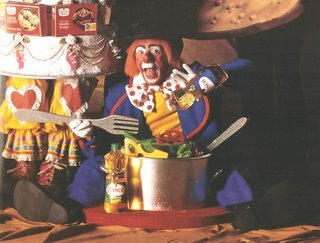 A longtime fixture in the gags of Paul Jung and famous for the line "Brad! Brad! Sebastian's back!" 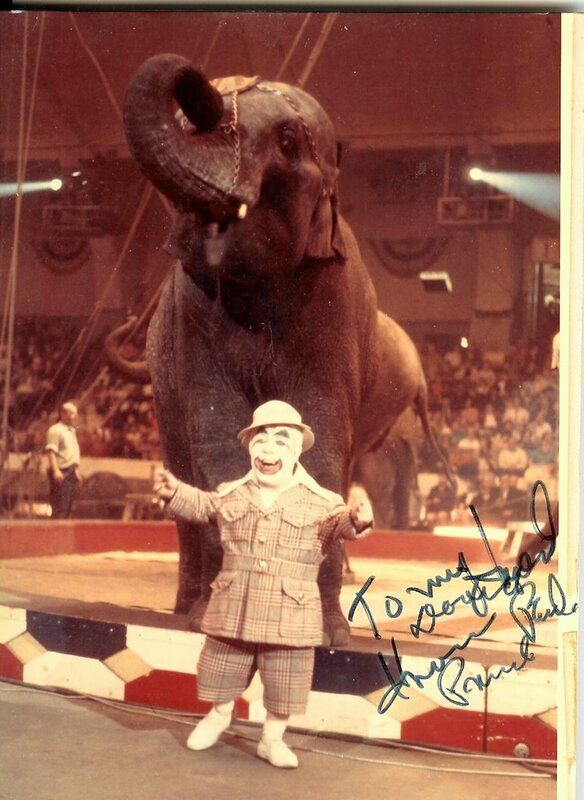 from Cecil B. DeMille's THE GREATEST SHOW ON EARTH, an autographed photo of "Prince Paul" Albert.